William V. D’Antonio earned a B.A. from Yale University, an M.A. from the University of Wisconsin, and a Ph.D. in Sociology and Anthropology from Michigan State University. After two years on the faculty of Michigan State, he joined the faculty of the University of Notre Dame as assistant professor. He served as professor and chair of the department there from 1966-71. 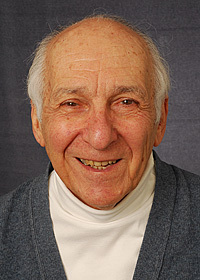 He moved to the University of Connecticut in 1971 as professor and chair. In 1982 he took a leave from Connecticut to become the chief executive officer of the American Sociological Association, where he served until his retirement in 1991. He received emeritus professor status from the University of Connecticut in 1986. In 1993, he joined the sociology faculty at The Catholic University of America as a visiting research professor. He is currently a fellow of the Institute for Policy Research and Catholic Studies. He is the co-author and co-editor of an array of books including: American Catholics Today: New Realities of Their Faith and Their Church, and Voices of the Faithful: Loyal Catholics Striving for Change – a study of Catholic lay social movements striving to help change the Church. His most recent publications are: “Religion and the American Dream: A Catholic Reflection in a Generational Context” in American Dream in the 21st Century, ed. by Sandra Hanson and John K. White (Temple U. Press, 2010); “Persistence and Change, Among American Catholics" a 28 Page Pullout in the National Catholic Reporter (October 28, 2011) highlighting the research done by D’Antonio, Michele Dillon, and Mary Gautier; and "Catholic Bishops and the Electoral Process” in Voting and Holiness: Catholic Perspectives on Political Participation, ed. by N. Cafardi, (Paulist Press, TBP). He has received an Honorary Doctorate of Humane Letters from St. Michael's College in Vermont, and was a Fulbright senior fellow in Italy in 2004.